SO MUCH BETTER THAN CANNED, YOU’LL NEVER GO BACK TO IT AGAIN! STEP 1: pumpkins come in many varieties. 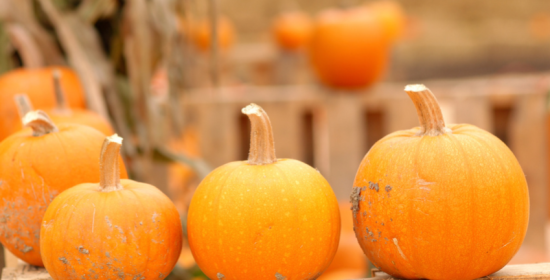 For pumpkin puree, select a sweeter, smaller, mini or dwarf pie pumpkin abut 6-8 inches in diameter verses the big round pumpkins you carve your Halloween jack-o’-lanterns from. STEP 2: preheat the oven to 350ºF. Wash the exterior of the pumpkin with water only [no soap], using a scrub brush to remove any dirt. STEP 3: cut the pumpkin in half down its mid-section, using a serrated knife and a sawing motion. Turn the pumpkin as you cut, taking care to end at the same point you began. There is no need to remove the seeds and membranes. STEP 4: place the pumpkin in a parchment lined shallow, glass baking dish with the rind down. Bake until soft and lightly browned, 30 to 45 minutes, or more, until soft. Pierce flesh of the pumpkin at its thickest part to see if it’s done. If still firm, it needs additional cooking time. When done, remove pumpkin from oven and cool completely. STEP 5: remove seeds and membranes. Optional—if you’d like to eat the seeds, rinse them clean, mix with Himalayan salt and continue cooking, on clean parchment paper until plump. Cool and shuck before eating. STEP 6: remove the cooked pumpkin flesh from the skin, using a smooth spoon to gently lift and scoop it out of the skin and into a food processor or blender. The rind and flesh should separate easily, in large chunks, if the pumpkin is cooked enough. STEP 7: process the pumpkin into puree. Let it process long enough, that you get a nice, smooth consistency. 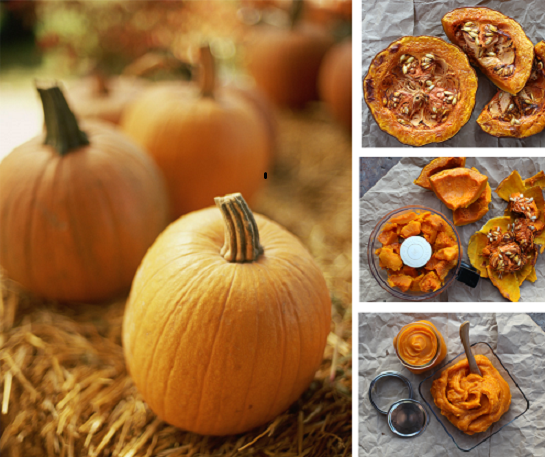 The pumpkin puree is now ready to use in recipes. Store unused pumpkin in an airtight jar in the refrigerator. It can be frozen then thawed before using. NOTE: “pie pumpkins” yield about 2-3 cups cooked pumpkin puree. The "Aloha Cooks" live in Hawaii and create original recipes using healthy whole foods and since one of them is a registered dietitian you can be sure they are delicious and nutritious.